Sun Lakes Arizona by Robson Communities is a magnificent 6,683-home community. It is comprised of five country club style neighborhoods that each have their own golf course and amenity center. A generous assortment of world-class amenities and social activities cater to the non-golfers who reside in this age-restricted community. Sun Lakes Arizona is in a great location on the south side of Chandler just 24 miles from downtown Phoenix. The community is conveniently located within minutes to I-10 and the 202 loop. Gilbert, Mesa and many popular shopping outlets in Chandler are a short drive from the community. In each of the five community sections, there is a clubhouse that includes fitness centers, restaurants, hobby rooms, swimming pools and ballrooms. The grounds are joined together by miles of walking and biking trails, scenic parks, fishing lakes, bocce ball courts and tennis courts. For golf-lovers there are five world-class golf courses in each of the neighborhoods. Regardless of where you live in this community, you can expect to have an assortment of enjoyable amenities at your fingertips everyday. The newer neighborhoods tend to have clubhouses with updated amenities. Homes in Sun Lakes Arizona were built over a 30-year time period. As a result, home styles and prices vary dramatically. Some buyers prefer reasonably priced older homes while other buyers opt for more newly constructed homes that feature modern floor plans and desirable upgrades. Home buyers can choose from a wide assortment of single-family and attached villas that range from 1,000 to 3,500 square feet. Not including manufactured homes there are several dozen floor plans available. Many of these floor plans offer several different configurations which make the number of floor plan choices almost limitless. Association fees vary by neighborhood and most are paid bi-annually. Homeowners who choose to live in an attached Villa enjoy additional exterior maintenance provided by the association and therefore pay an additional condo fee each month. The original phase of the community offers some manufactured housing. There are five neighborhoods in this community, including Oakwood, Ironwood, Cottonwood, Palo Verde and Sun Lakes Country Club. Each neighborhood has a unique look and feel. 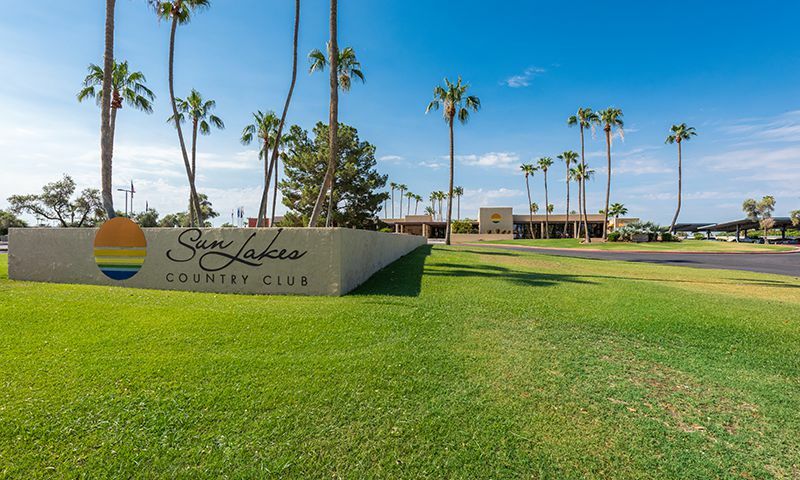 The original neighborhood is Sun Lakes Country Club, which is a non-gated community that was started in 1972. After the completion of the Sun Lakes neighborhood, Robson built Cottonwood and then the Palo Verde neighborhoods, which collectively contain 3,809 homes and share the same home owner's association (HOA). Both the non-gated Cottonwood and the gated Palo Verde neighborhoods offer private equity golf courses. The fourth and fifth neighborhoods are Ironwood and Oakwood, respectively. These two neighborhoods are gated and are located north of Riggs Road. They share a common association which is known as IronOaks. Each of these communities offers the newest collection of homes and golf courses that are open to the public. There are many clubs, activities and events that make the community ideal for active adults who want to stay both physically and socially active. Several dozen clubs meet on a regular basis. The community clubs and interest groups provide a great outlet for like-minded residents to gather with other homeowners who share similar passions. A community calendar is continually updated to inform residents of the latest fun activities, educational classes and exciting trips. Each association has an activities director and dozens of social clubs. Sun Lakes is located in Central Arizona just south of Chandler. Residents live close to many casinos, upscale shopping plazas, a variety of restaurants, spas, health care providers, libraries, and more.Attractions like Firebird International Raceway and an 1800's old west town, Rawhide. With Phoenix Sky Harbor International Airport about 20 minutes away, owning a home in Sun Lakes makes it easy to travel all around the world. Within a drivable distance to Phoenix and Tucson, homeowners can enjoy all of the rich history that Central Arizona offers. There are plenty of activities available in Sun Lakes. Here is a sample of some of the clubs, activities and classes offered here. There are several styles of attached single-level Villas located in Sun Lakes. Most are located in the Cottonwood and Oakwood neighborhoods. The attached homes in Cottonwood are typically arranged in units of four and the models in Oakwood are duplexes. Residents of the attached Villas enjoy the added benefit of no maintenance exteriors. As a result, homeowners who live in the Villas pay an additional monthly condo fee on top of their normal association dues. This fee varies by association. Not all models and floor plans are shown. The Premiere Series Homes are dotted throughout the Sun Lakes neighborhoods. With numerous model choices each containing several different configurations there are around two-dozen floor plan options. Association fees vary by neighborhood. Not all models and floor plans are shown. The Luxury Series homes are located in several neighborhoods in Sun Lakes. There are over a dozen of these models and each offers multiple variations of each plan. Association fees vary by neighborhood. Not all models and floor plans are shown. There are many single-family floor plans offered in Sun Lakes. These models are located in various neighborhoods. Due to the age of some of these homes, floor plans and information is limited. Below is a sample of some of these plans. Not all models and floor plans are shown. Manufactured homes were built in the original phase of Sun Lakes. No floor plans or model information is available on these homes. They started to remodel fitness center in may of 2018 ,4rooms only. It is now in the middle of Dec. 2018 , Not done yet. Something wrong here? My house flooded and was totaled. I'm working with insurance, with a mortgage company, with a builder, with someone to remove the house, with the Home Owners Association. Instead of being kind, neighbors on Navajo Place have been jerks. The home has finally been removed. I have a date for a new manufactured home to be installed October 5, 2017. Neighbors are complaining that my lot is empty. I have contacted SL HOA and kept them informed of progress. Now they're threatening me with substantial fines because it takes a few months to build a house. I can hardly wait to sell this house and get out of here. We love the homes and the people. The lifestyle is very easy. We loved that every day, even if we had to work, felt in part at least, like a vacation. Our only dissatisfaction was with the HOA. It may just be the "nature of the beast", but it seems as though the Board attracts people who are filled with PMA on OPM (positive mental attitude on other people's money). I have recently retired and my wife and I enjoy all the amenities that this adult community has to offer. There are 20,000 residents, five country clubs, plenty of restaurants, pools, retail, banks and even churches. This used to be a great place. Now the HR director has her hands in everything and the entire structure is in trouble. I don't understand why some people think they can do everything. My friends and I have stopped going to the restaurants and are actually thinking about selling our homes if things don't change very soon. My wife and I moved here in 2007 from California. We were looking for an Active Adult Community with golf, swimming pools, restaurants, and close to Phoenix. We chose Oakwood at Sun Lakes that met all of our wants and needs. The 45 holes of golf, the restaurants and pools are outstanding. The community and all of the amenities are well taken care of and the people are real friendly. Purchasing a home in the Sun Lakes area will be like living at a resort year round. Do it now. You won't be disappointed. I moved to Sun Lakes for the convenience for my job in the beginning but now am retired at 60 and enjoying the Community. Oakwood Championship golf course has 27 holes that offer's challenges for any handicap. In addition to the Oakwood golf course there is another 18 hole Championship course in Cottonwood and 3 other shorter courses within the Community. I like that I can leave for months at a time and not worry about my home. The Community is very well maintained & all of the Homeowners take care & pride in their homes. I am very happy with my choice to live here. I started out selling new homes in Sun Lakes in my thirties and never dreamed I would end up living here myself. I purchased a home & moved to Sun Lakes at 42 & have never regretted it. Sun Lakes is a 40+ Community which offers so many activities & clubs that you can't get bored. The Country Club amenities are top notch & always very well maintained. You don't have to worry about your neighborhood or your neighbors yard as the grounds are always meticulous! It feels good living in a Community where people are friendly & happy & out enjoying life! I've never regretted my decision to move here. I have lived in Sun Lakes for over 20 years, and I still think it is an amazing place. I love that everything is so clean and well kept and it is very quiet. I love that the people are friendly, that everything I need is so conveniently located, that there are so many activities within the community. I like the easy freeway access and two airports within a reasonable distance. All of this and I haven't even mentioned the restaurants, golf courses, swimming pools, and tennis-pickleball facilities within the community. I wouldn't hesitate to recommend Sun Lakes to anyone looking for an adult community. Look no further, Sun Lakes really is the best active adult community in the valley. I moved here from the midwest in 1993 and was looking for a community that offers a small town feel in a very big city. Sun Lakes offers all that and more. Tons of amenities, there is reciprocity between 5 subdivisions so you have lots of choices regarding clubhouses, golf courses, swimming pools and much more. Many communities have just one clubhouse, maybe a couple of pools. Easy access to the airport and major freeways. Like I tell people "We are close, but not too close." Hop on 101 and be in Scottsdale in less than a half hour. Everything you need for day to day shopping is right here and lots of additional shopping and restaurants very close, to include Chander Fashion Square Mall less than 10 minutes away. It doesn't get any better, been here for 20 years and no regrets! 55places.com is not affiliated with the developer(s) or homeowners association of Sun Lakes. The information you submit is distributed to a 55places.com Partner Agent, who is a licensed real estate agent. The information regarding Sun Lakes has not been verified or approved by the developer or homeowners association. Please verify all information prior to purchasing. 55places.com is not responsible for any errors regarding the information displayed on this website.